This Admin, secretarial & PA Training will help you obtain the basic office skills necessary to perform professionally and efficiently the daily tasks required of a secretary or Personal Assistant. 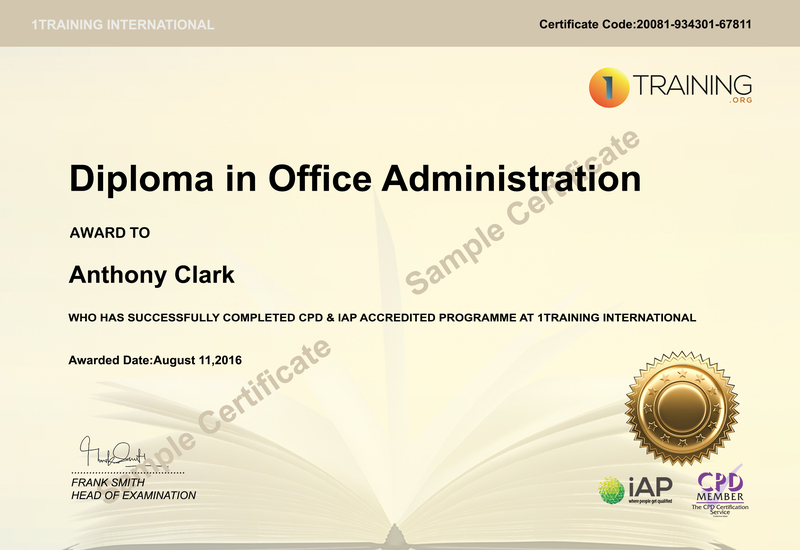 As you progress through each lesson you will learn how to become a skilled office admin, Secretary or PA in today’s technology-based offices. Our Executive Secretarial, Admin and PA Training offer you the opportunity to study 24/7 wherever you are in the world. These intensive on line courses are opened to anyone with an interest in the topic and give you access to world-class learning led by 1Training International. By enrolling to this course, you’ll become an expert in customer service. In this course, you’ll learn receptionist and telephone skills. This course, will teach you how to produce standard documents. Logging in to this course, you’ll learn master key Microsoft Office programs. This course will teach you about reports, letters and CV writing. Having this course, you will become masters of data management and record keeping. On completion of this course, you will gain the knowledge in appointment booking and interview arranging. At the end of this course, you’ll gain best management skills and you can be the motivator of your employees. At the end of the course learners will take an online multiple-choice question assessment test. This online multiple-choice question test is marked automatically so you will receive an instant grade and know whether you have passed the course. Upon successful completion of this course, all learners will be awarded a FREE e-certificate (PDF format), and can also pay only £19 to receive a printed version of the certificate if they wish. Those who successfully pass this course will be awarded a Executive Secretarial, Admin and PA Training Certificate. Anyone eligible for certification will receive a FREE e-certificate with NO additional cost. There are different paths in which your career could develop. You can be an Office Admin, Office Manager, Secretary or Personal Assistant for company director, executives or for senior management positions. Kindly purchase the course from Reed and you will receive the online access within 48 hours.